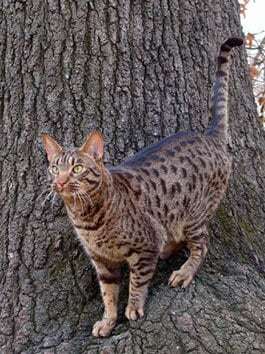 Considered to be one of the most magnificent accidents in the cat fancy, the Ocicat is the result of a fairly recent chance breeding done by Ms. Virginia Daly of Michigan between her cats: an artificially-bred hybrid Abyssinian x Seal Point Siamese female and a Chocolate Point Siamese male. Ocicats are a medium-sized and well-proportioned man-made cat which is solid and muscular with a perceptible plumpness of body and chest. Ocicats have a triangular-shaped head, tufted and lynx-like prominent ears, almond-shaped eyes which should come in any color except blue (as it’s not permitted in the show ring), strong chin, powerful legs and paws, and a straight, tapered tail which usually ends in black. Moderate in type, Ocicats are neither exceptionally chunky or cobby, or particularly elegant or Oriental in appearance. Their short, soft coat is markedly lustrous with a satiny sheen. It can come in a large array of colors like Blue, Black, Cinnamon, Brown/Chocolate, Lilac/Lavender and Tawny/Fawn. Silver-based varieties of the above mentioned solid colors are also available. Also, other cat registries recognize the Cream, Red and Tortoiseshell types. Despite the breed’s wild and exotic appearance, the Ocicat is neither ferocious in disposition, nor is it shy or timid in temperament. Ocicats are a loving and affectionate breed that is unswervingly loyal to their owners. The breed is not overly pushy, demanding, or clingy. Also, they are self-confident, extroverted pets that are friendly and rather gregarious even with strangers. Because of the Ocicats remarkably personable and extremely social nature, they generally get along well with other household pets like dogs and other cats. Nevertheless, Ocicats are not suited to being left alone for too long as they require constant attention and companionship. The breed’s delightfulness, intelligence, as well as adaptable and welcoming nature are an obvious proof to its close Siamese, Abyssinian and American Shorthair lineage. The Ocicats short, shiny coat is very easy to groom. Just brush it on a weekly basis to get rid of dead hair and, at the same time, distribute the skin oils that keep its hair radiant. Baths are hardly ever necessary unless you will be taking your Ocicat for a show. The rest is basic care like regular nail trimming, ear cleaning and dental upkeep. Ocicats are an especially healthy cat with no predominant health problems. Their broad gene pool gives it a powerful hybrid vigor which provides it with an increased healthiness, soundness and productivity. This is a result of being part of the first few generations of a crossbred animal which came from the mating of unrelated parents. In fact, Ocicats are said to have a long lifespan. Nevertheless, keep in mind that they can still inherit some of the health issues that affect their parent breeds like periodontal disease, liver or renal amyloidosis, hypertrophic cardiomyopathy, and pyruvate kinase deficiency. Like most breeds, Ocicats also thrive well in an indoor living environment with responsible owners who can love and take care of them all the time.